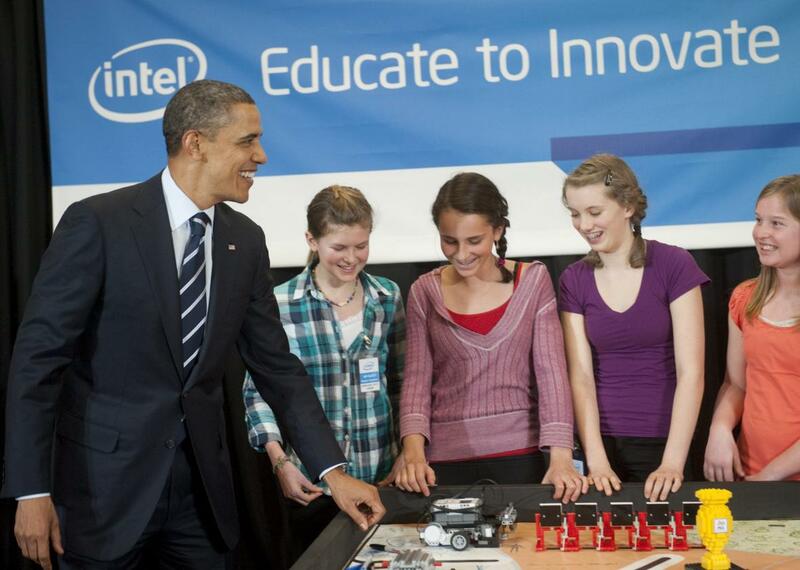 Intel drops $6 million in funding for Science Talent Search starting in 2018. President Obama with Science Talent Search finalists in 2011. Lame, right? Better defund. Semiconductor chip maker Intel has been having some problems lately. Revenue is down and the company has even done some layoffs. But things aren’t all bad. In January, Intel committed $300 million to a five-year plan for improving racial and gender diversity in its workforce. Unfortunately, though, high school student enrichment is coming down on the wrong side of the situation. The New York Times broke news Wednesday that Intel isn’t going to fund the prestigious Science Talent Search research competition anymore. Any U.S. high school senior can submit an independent research project to Science Talent Search. Out of thousands of entries, the competition chooses 300 semifinalists and then 40 finalists. Past finalists and winners, known as “alumni,” have gone on to win eight Nobel Prizes and numerous other accolades. They include researchers like futurist Ray Kurzweil (1965) and even actor Natalie Portman (1998). The nonprofit that runs the research competition, the Society for Science & the Public in Washington, D.C., confirmed that Intel won’t be the sponsor after 2017. The competition started in 1942 and was sponsored by Westinghouse Electric until 1998, when Intel took over. The Times reports that Intel was spending about $6 million a year on the contest, and the new sponsor will have a similar annual obligation for at least five years. It’s unclear why exactly Intel is no longer interested in reaping these benefits. The Times called it “a puzzling decision,” noting that the sponsorship commitment would have been 0.01 percent of Intel’s $55.6 billion revenue last year. Intel said in a statement to NBC News that it is “proud of the legacy we have helped create around the Science Talent Search in partnership with the Society for Science & the Public.” It did not elaborate on the reasons for its decision, and has not responded to a request from Slate (or other publications) for comment so far.